That’s over 50% done! I can now field half the players for an Undead Blood Bowl team – for one drive at least. 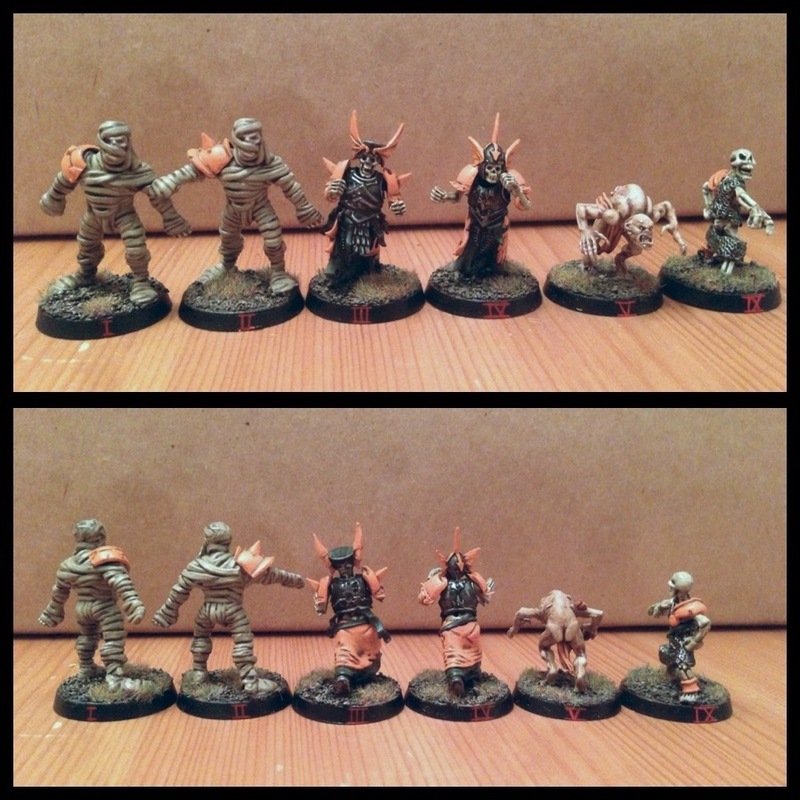 This weekend I painted the Skeleton and the team’s first Ghoul. The Skeleton is the team’s designated fouler. So this a crewman model for the old Screaming Skull Catapult (from before the Undead forgot how to use it) is great as he is pointing out to the team’s muscle players who they should knock down for him to boot. Lovely. I’ve struggled with models for Ghouls almost from day 1 of this project. I eventually bought, stuck and undercoated Mantic Ghouls but since doing so I like them less every time I see them. Spindly fingers and odd posture are, I think, my main issues. 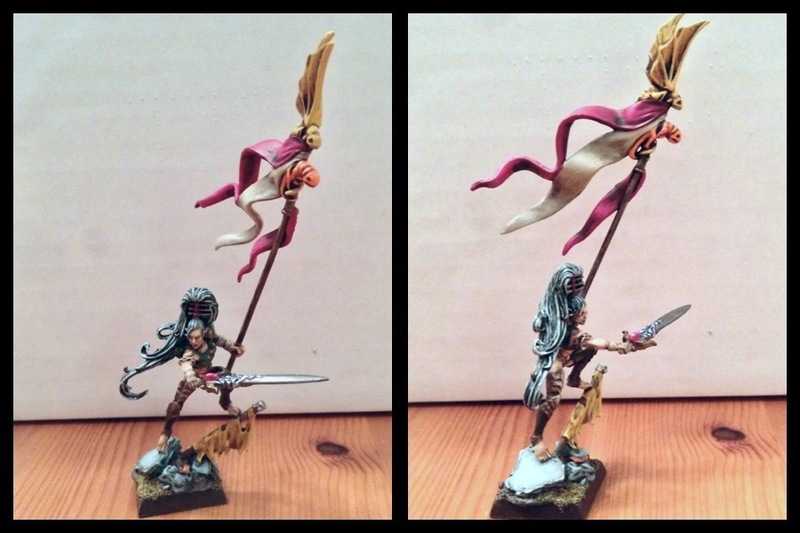 So, I looked again at the GW plastic Ghouls. Now, my Warhammer army never got more than a unit of 10 Ghouls because I’ve never liked the new models – the spiny growths and skin piercings left me cold. I wanted degenerate humans, not some new species of… something. Simple solution then – shave a GW Ghoul. And I think I just might shave three more! Though, it’ll need careful selection of which sculpts are most conducive to shaving. 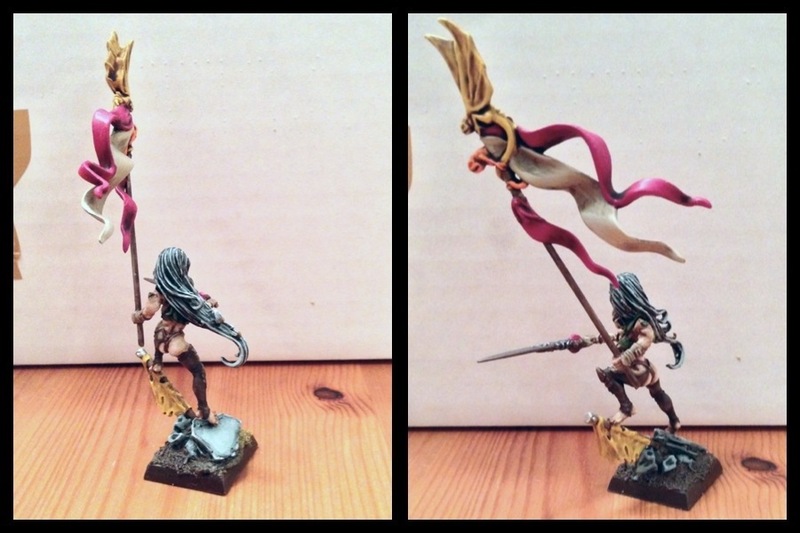 I bought the Dark Eldar Lelith Hesperax model on its release – in metal! I thought there was a Wood Elf conversion in there somewhere. Now I’ve done it. I didn’t expect her to end up as my BSB though. I think it just about works. Lovely model to paint and although there are a couple of artefacts of 40k detailing I couldn’t remove I don’t think a casual observer will spot them. Oh man. It’s been a while. I didn’t make it to that tournament and the Orks haven’t seen any more paint. But… Maybe I’ll post some more now. Why? I’m not sure but I fancied dusting off the WordPress account and giving it all a whirl again. Maybe it’ll give me something to look back over in years to come and see my hobby progress. Maybe not. Maybe it’s just an opportunity to write in stream of conscious rather than the careful pitch of a bureaucrat. Whatever. I paint dead things. I do! I’ll show you. See! After 15 years of talking about it, I’ve finally made progress on an Undead Blood Bowl team. It’s taken me about 10 paint sessions to get these 4 guys done, but I think they’re worth the time. 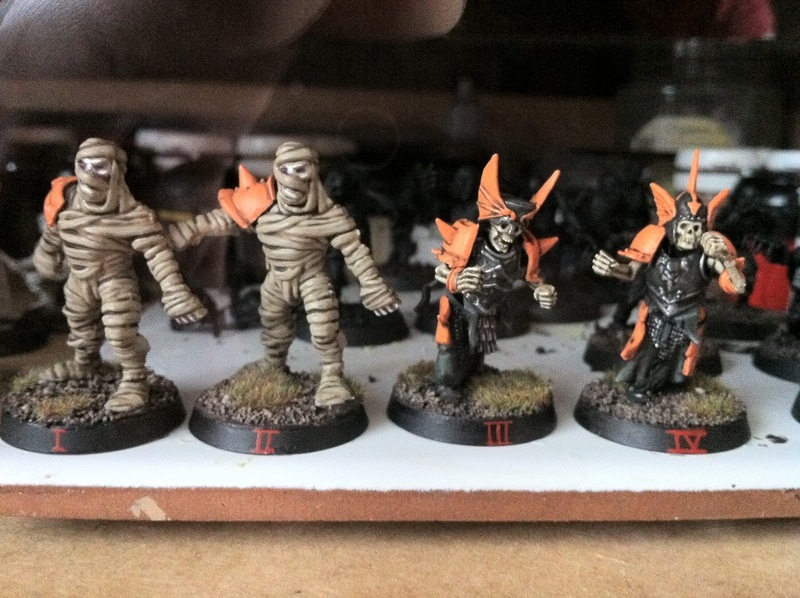 Ghouls up next – my least favourite choice of miniature. I’m half expecting to find myself switching back to GW Ghouls after painting these. We’ll see. 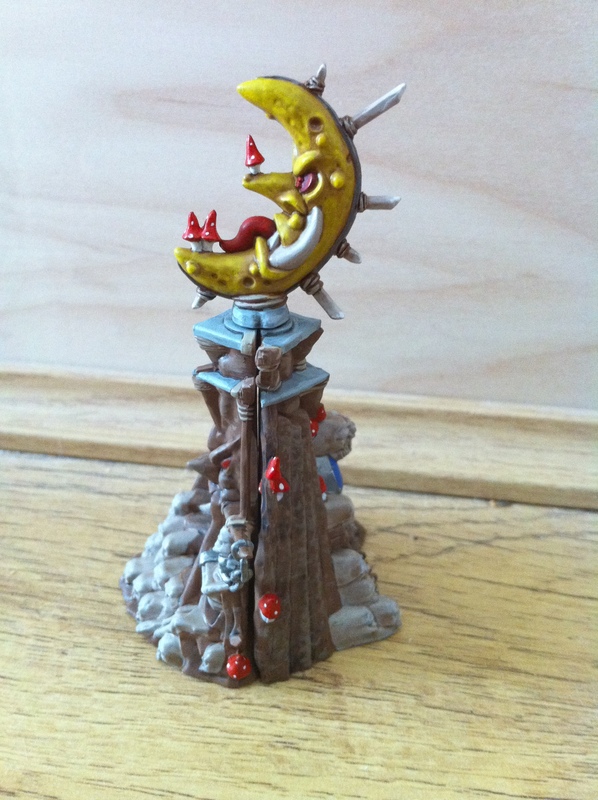 Over the weekend I have painted a) the conservatory next door and b) a Bad Moon totem scenery piece. 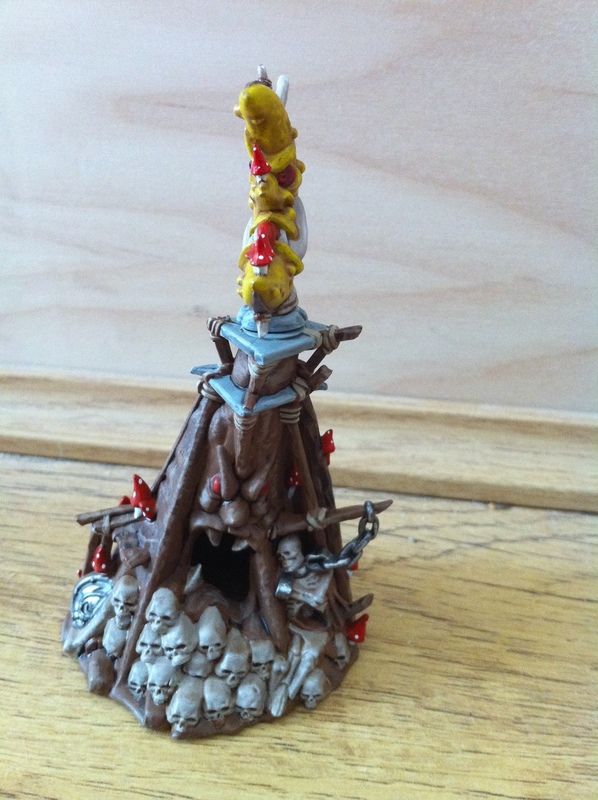 The plastic scenery piece that came back in with the 7th Edition Warhammer boxset has a Bad Moon effigy on top of an angry looking hollowed out tree. This was a surprisingly enjoyable piece to paint. Despite having had it sitting around for a number of years I’d not appreciated the detail on the casting. The chained skeleton, the Troll skull above the read entrace, the mix of 6th Edition and smaller 7th Edition skull pieces were all revealed to me during the painting process. I started with a brown undercoat for everything. 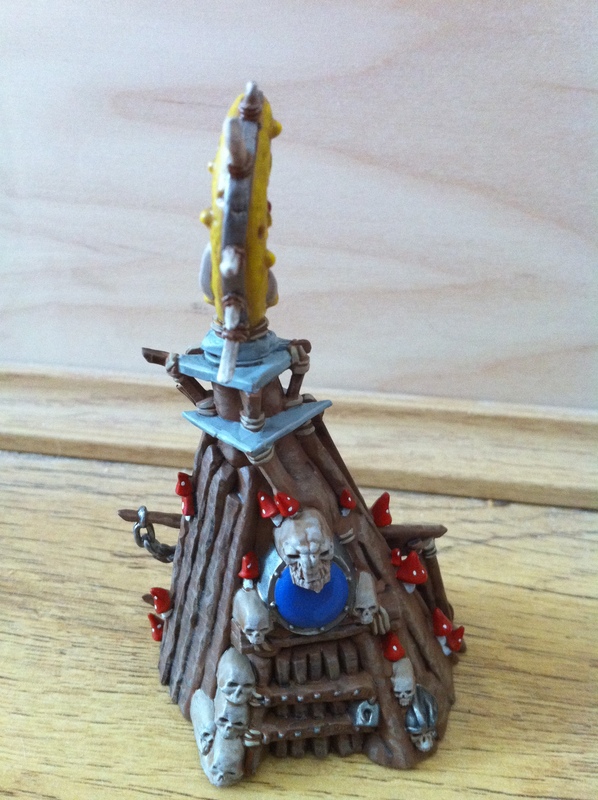 From here I concentrated on the Bad Moon itself with foundation colours – Iyanden Darksun for the moon and Dheneb Stone for the bones and teeth and Boltgun Metal for the metal frame. This was all washed with a Coat d’Arms Dark Brown wash for depth. 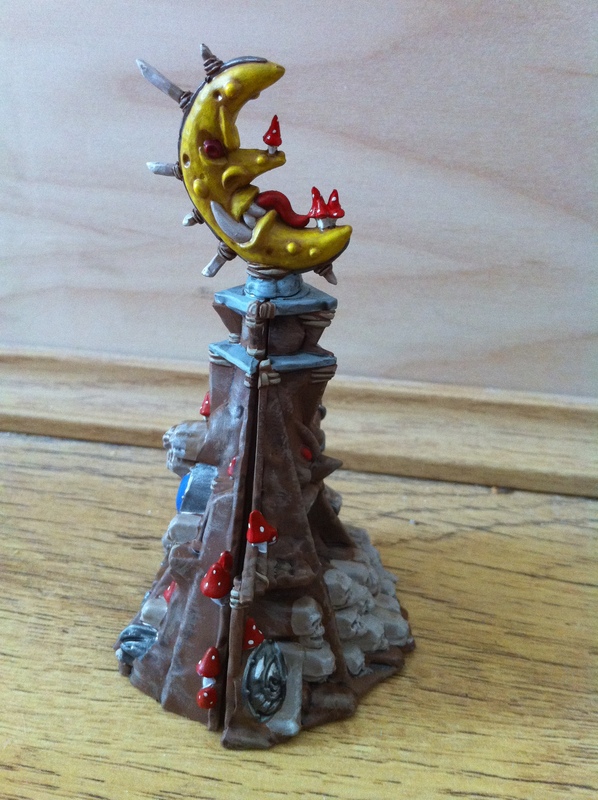 I then gave the moon a number of thin coats of Sunburst Yellow, focusing more and more on the highlight areas. When I was happy with the texture of the moon I filled the eyes and tongue with Scab Red and highlighted the bones. The angry tree was my standard wood shortcut at the moment. Black wash over the brown undercoat and a P3 Beast Hide drybrush to highlight. The skull piles were treated as per the teeth and bones on the moon. Finally I worked back at gave all the mushrooms slightly off-white stalks, and blood red booms. White dots were added for that traditional Goblin fungus look and to brighten the whole piece up. Now, the real question is how will this piece work in games? The new 8th Edition book gives us a few options for interesting effects however none quite fit to my mind. The Idol of Gork (or maybe Mork) sounds nice and Orcy, but is not appropriate as it’s clearly not invoking either Orc god (and I have an old cardboard piece from the Idol of Gork scenario pack that is perfect for this already). Maybe it could be a Wizard’s Tower? There’s a little door for a Goblin Shaman to enter and practise his magic. Maybe a Sinister Statue? I can easily imagine the Bad Moon totem swivelling and zapping anyone silly enough to go near. What will it be? Well, my current favourite is to go beyond the rulebook and create my own rules for it. Orc and Goblin psyche is complex in it’s simplicity. They live to fight. But who to fight? One moment they’re fighting humans and the next they’re fighting each other. Any unit starting a turn within 6″ of the Bad Moon totem becomes subject to Orc and Goblin special rule: Animosity for the duration of the turn. Any unit already subject to Animosity becomes even more unruly. Amend the Animosity Table to 1-2: Squabble, 3-4: Plan’s a good ‘un, 5-6: We’ll show ’em! I’m tinkering with another new blog. Hopefully this’ll see a bit more activity now that I can interact with it while roaming. As ever I’m hoping to record my thoughts on various nerdy (and some serious) topics. Let’s just see how it goes, eh?